A few months ago BRUUT! released their latest album Superjazz in a sold out Bimhuis. 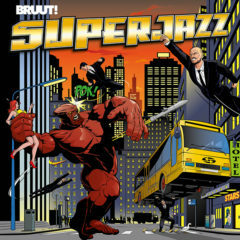 The release of Superjazz resulted in raving reviews by the Dutch press and was followed by extensive tour through the Netherlands. To top it all of today the band received the news that Superjazz is nominated for the ‘Edison Jazzism Audience Award 2017’. For this category the jury has chosen eight albums for which fans can vote. The voting has started today so be sure to head over to this page and help BRUUT! win this prestigious award. Want to here more of Superjazz? BRUUT! has extended the Superjazz tour with a list of shows, ranging through the summer.